After we upgraded our Shop software especially the “i lost my password” page no longer worked as expected. Users got a http-404 Page not found error. Users have published their download link to give “free” access to people who did not purchase our products. Easy recovery from lost password. The Web account is independent from your SL Avatar or your Paypal account. You have to register your purchases manually. We have been trying to automate this as much as possible and we have still a few ideas how to improve, but for now you need to do a manual registration. However this is really made easy for you. Below you find a 4 Steps user guide. Note: Since Tuesday 7 October 2014 you only get the newest product files. However if you switch to the new account based system, then you will get back the access to the product archive. If you already have an account on our Website, then please open the next tab right below this box (see “Login to Existing Account”) and login from there. What are my benefits when i create an account? – You can use any account name you like. Important: The purchase of a product from us does not automatically create an account for you! If in doubt then consider to create a new account (see toggle bar above). There is no problem with that. It is very important that you are Logged in to your account before you proceed to the next Step below. You normally find the activation link in the Nearby Chat right after purchasing. You normally get the activation link via Email within 60 minutes after purchasing. Make sure you are logged in to your new account on the Machinimatrix Website. Then Call the download link that you have recovered in the previous step. Locate the purple Octopus that sits in the little Witch hut. Receive your download link in the URL Popup window. Please look for the Witch hut on the right side of the Shop. We send you an Email containing a list of your purchases. Now all your purchases are assigned to your account. Note: If you already created an account and logged in on the Machinimatrix Website, then your product activation link beams you directly to the download section and you are done. Do not forget to include exact information to which email address you want to change your purchases. Sometimes it happens. You had setup an account in a hurry months ago. But now you need the account again but you forgot all the details. You remember which Avatar you used while purchasing from the Jass Shop or which Paypal email you have used while purchasing from the Machinimatrix Website? Just create a new account and register your products again. If you forgot your product activation link, then scroll up to the chapter “In case you lost your download link”. Double check that your Paypal purchases show up on your product page. Click on the octopus and you get a registration link in the chat window. Open your favorite Web Browser. Ensure you are Logged in on your Machinimatrix Account. Keep your browser open ! On the right side of the Shop you see a small Witch Hut with an Octopus inside. Click on the Octopus to receive a connection link. Now your product page should open and your product should be available for download. If you purchased a long time ago, then your product activation link possibly is no longer recognized by us. In that case proceed as if you have lost your download link(see above). All you need is the product activation link of the purchased product. You got this by email when you purchased from Paypal, or you can get the link from the JASS Shop in SL if you purchased from there. Login to the destination Account on Machinimatrix (the account where you want the product to be maintained). Now call the product activation link from the other account. This should move the product from the other account to your current account. Then just click on the Register&Login button (see image). Click this link and follow the instructions given there. Then at the bottom of your purchased download page you find the link to the page Register me now. Follow the link to create your account and register your purchases permanently. From now on and forever you will find your purchased products on your My Products page. Your download period times out 8 days after purchase. If that happened to you then you see the note shown at the top of the image aside (pink background). You can click on the Link labelled Register&Login to get back to your purchases. I haven’t been on the site for some time, I had previously registered and logged in, at that time I downloaded my products. my login was saved in my last pass account and I used it once or twice after that, but now it won’t accept my login and says my username is no good. I tried the password recovery but after many tries to enter all variations of my username I can’t get in. yet my download page is not an issue…it lets me download and the other pages recognise me but won’t let me login, so I have no clue what to do… Help! Please!! i have added a remark about product download page and machinimatrix account. That is not the same! 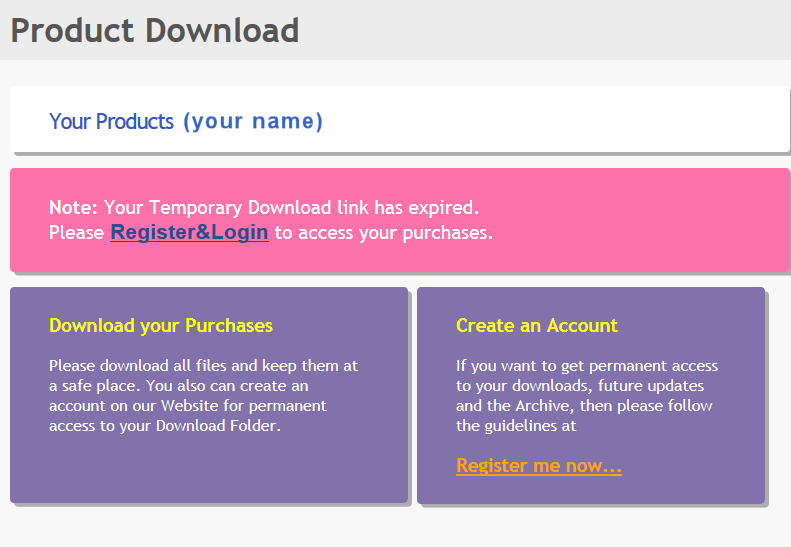 You can have a product download page without need to have an account. We decided to do it like this after we got so many complaints from users who under no circumstances want to register an account on our website. Lost my pw and my username is not my email, and I tried Aleida Rhode as username, but denied.